Alright y'all, I think this tee is my favorite! I know that it's the first one of the blog post but it's so cute. It's also extremely soft, and what more could you ask for in a cute tee? Styling: For this tee I would pair it with my black jeans as seen here and then I would grab a denim jacket and throw it on top. That way you don't just have a t-shirt and black jeans. The denim jacket is going to accessorize the look enough for you! Add some beads to complete your ultimate Mardi Gras look! 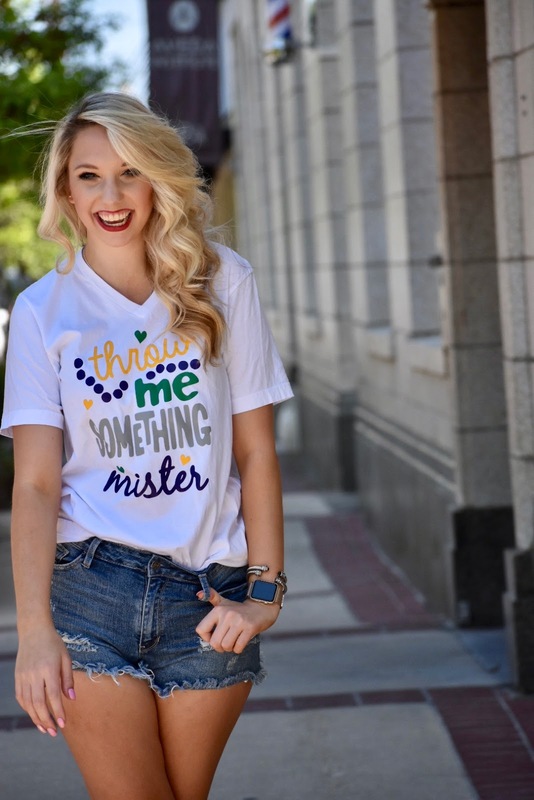 This tee is a super cute option that would be a fun one to style! 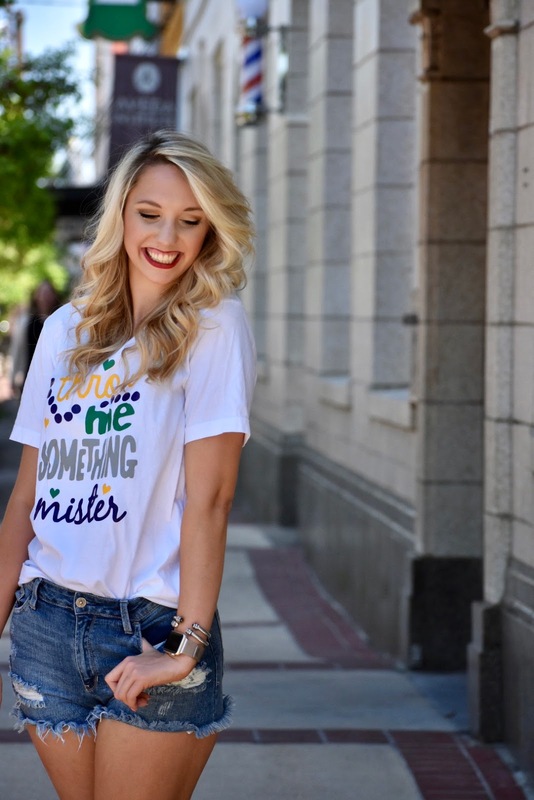 Show off your NOLA pride with this 504 tee! This is another tee that is also super soft, I like the white tee because it's great to wear with darker bottoms! Styling: To style this one I would grab a cute denim skirt and a skinny belt! This shirt would look super cute with the denim skirt and you'll be super comfortable all day long! Grab a cute pair of little white sneakers to continue the white trend and keep you comfy on your feet all day long! This tee is by far another favorite of mine! I love all of the different colors on this one! As y'all can tell her white tee's are my favorite! This one I would style more dressy then the rest of them! Styling: This one I would pair with a pair of dark wash jeans and then I would throw on a cute pair of booties! But, be careful and make sure that you are choosing a pair of booties that you know you can stand in all day! The booties and the dark wash jeans are going to dress this simple tee up a little and you'll be looking extra cute on the parade route! 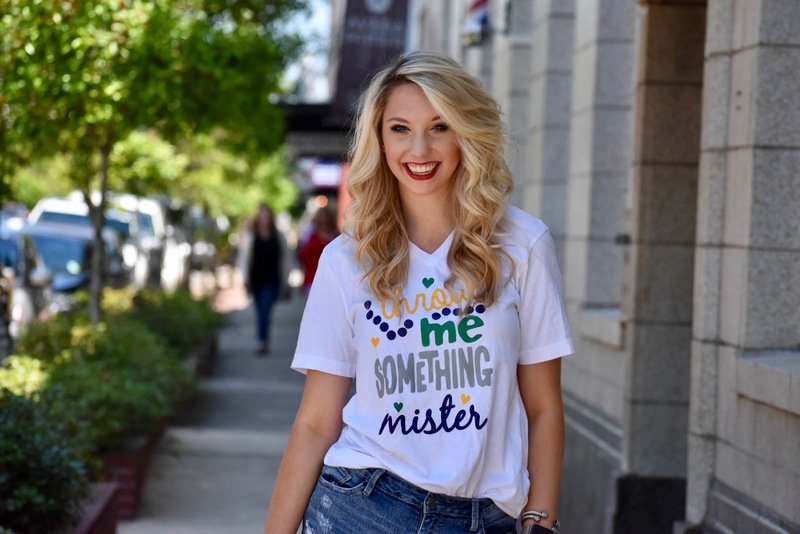 This little tee is so much fun and perfect for all ages! Since this tee is more whimsical, I would style it differently than the rest of them! Styling: To style this one I would find a gold metallic skirt, or gold metallic leggings. It's a fun shirt so some fun bottoms would make it even more fun! I hope that this post gave you some inspo on some Mardi Gras outfits for this Carnival Season! While you're shopping those make sure to check out all of the other cute things that Victoria's Monograms sells! !